Hong Kong: Lived it, Loved it. View the Hong Kong slide show! The Hong Kong Tourism Board’s slogan says, Hong Kong: Live it. Love it! In September, we spent a memorable week living and loving this land of intriguing contrasts. The hardest part of any great trip is when it’s over. The second hardest part is when you realize you’ve only got one day left. Feasting on jumbo prawns and cold Chinese beer at an idyllic seaside café on Lamma Island, Chris and I were almost feeling nostalgic as we savoured the last few hours of what had truly been a fantastic week in Hong Kong. Our goal of mixing business with pleasure had been more than fulfilled. Our book, “Best of The Times Magazine,” was being printed in China, and we had attended to technical matters; but we also were able to enjoy an adventure that rivaled some of our best journeys taken before the advent of careers and children. Once avid off-the-beaten-path travelers (we spent a year traveling around the world for our honeymoon), we hadn’t had the chance to enjoy much exotic travel over the last 14 years. For this trip the kids had opted to stay home, not wanting to miss the first days back to school, so we were once again, on our own. It was almost like old times. We managed to pack a lot into our stay here in this fascinating city. It hadn’t taken us long to deduce that Hong Kongers have two main pastimes: eating and shopping. Oh, and talking on their cell phones (O.K. – that’s three). Everyone has a cell and they work everywhere – subway, elevators, you name it; the kids wear them around their necks on a chain and they double as audio players. We soon found ourselves following their lead; we shopped and ate to our hearts content. The only thing missing was the cute little phone. By early evening, streets in Hong Kong teem with people hurrying to and from stores, restaurants, outdoor markets and food stalls. Over the course of the week, we discovered that salty giant shrimp washed down with a cold Chinese beer at the popular Temple Market in Kowloon, an outdoor night shopping mecca, is definitely worth a repeat performance. And every dim sum stall we sampled was better than the last. Though generally not the tour group type, we had heard that Hong Kong discovery tours are a great way to gain one’s bearings in this city of nearly 7 million. On our first day, we hopped a tour bus guided by Roger, a local with a charming British accent, who was a font of information. We soon found ourselves perched atop the world-famous Victoria Peak, an ideal vantage point for a spectacular and much-photographed panorama of Hong Kong Island and Kowloon, across the bustling harbour. Unfortunately, a hazy day (air pollution drifting in from China, according to Roger) meant our view was not as awe inspiring as it should have been, but the magnificent skyline still captivated us. We had ascended Victoria Peak aboard the Peak Tram, Hong Kong’s famous funicular railway, which began operation in May 1888 and has served Hong Kong for well over a century. It was a lark taking this vintage tram up the steep slope and experiencing the bizarre sensation of standing at a 45-degree angle. Hong Kong is Cantonese for “fragrant harbor,” a name inspired either by the incense factories that once dotted Hong Kong Island or by the profusion of scented pink bauhinias, the national flower (whose representation has recently replaced colonial insignias). 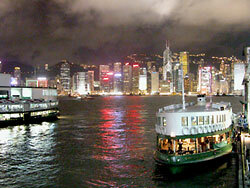 Originally a fishing village, Hong Kong was no more than an outport when it came under British rule in 1841. Today, there are hundreds of skyscrapers that span Victoria Harbour as far as the eye can see. As we gaze through the haze at these canyons of concrete and glass, we find it difficult to picture the Hong Kong that was. But later, when we explore the city’s “canyons,” we discover pockets of Hong Kong that are stuck in time. Despite its deep British roots, with street names such as Nathan Road, daily high tea at the colonial Peninsula Hotel and double-decker buses, Hong Kong clings to its Chinese roots. This makes it an ideal gateway for western travelers hoping to experience Chinese culture, as English is spoken everywhere. 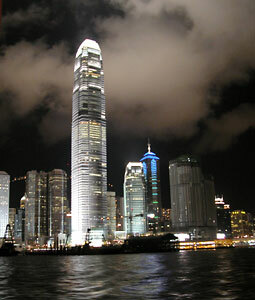 Two International Finance dominates the Hong Kong side of the harbour and is the 9th tallest building in the world. China is home to almost half of the world’s 20 tallest towers and high-rise buildings – most built with bamboo scaffolding! A popular attraction with visitors and locals alike is the mesmerizing “Symphony of Lights.” Since May of this year, hundreds of people have been lining Kowloon’s waterfront for a spectacle worth seeing again and again. At eight every night, 18 buildings on the Hong Kong side (35 more will be added soon) come alive with searchlights and coloured lasers. The buildings’ façades are festooned with complicated neon lighting that constantly changes colour. One of the larger buildings even has the number three, a lucky number for the Chinese, running up its side in lights. Lasting twenty minutes, many of the buildings keep their neon switched on after the show ends. A great place to watch the lights is from the bar of the ultra-chic Inter-Continental Hotel in Kowloon, while enjoying a cocktail and listening to live jazz. Taking a cruise on the ridiculously cheap “Star” ferries is another splendid way to experience the scene (for less than 40 cents!). The waterfront promenade in Kowloon has recently been transformed into “Avenue of the Stars.” A lighted path of embedded stars leads the way to the hand and footprints of local film actors and directors, including Jackie Chan – of course. Hong Kong is geographically compact and boasts one of the world’s most efficient, safe, affordable public transport systems. The subway system is impressive, clean, efficient and extremely high-tech, as is the bullet train from the new airport. This airport, built on an island reclaimed from the sea since land is so scarce, replaced the harbour airport, once rated by travelers as one of the most exhilarating landings in the world. Taxis and double-decker buses are plentiful on both sides of the harbour and while taxi drivers are admonished to take the shortest route to a destination, we realized on our return trip to the airport train terminal from our hotel, that our first taxi driver had taken us for some extra sight-seeing. Hong Kong Island’s double-decker trams aren’t fast, but if you’re not in a hurry, they’re a cheap and fantastically fun way to experience ‘old’ Hong Kong. Try to get a seat at the front window upstairs for a first-class view. A fleet of Star ferries whisks passengers across Hong Kong harbour forless than 40 cents Cdn – a superb way to experience the mesmerizing “Symphony of Lights” on the skyline. Riding on the Star Ferries across the narrow harbour between Kowloon and Hong Kong Island gave us a sense of what it must have been like when ferries crisscrossed the Detroit River. The Star Ferries even looked like the ferry steamers operated by the Detroit-Windsor ferry company. But most of the time we simply walked. Hong Kong Tourism provides an excellent guide to walks in the city and region, and the maps and descriptions are very accurate. One must-see attraction is the Giant Buddah on Lantau Island. About 230 islands belong to the territory of Hong Kong; Lantau Island is the biggest. It has very attractive mountain scenery (the highest mountain is Lantau Peak with 934 meters) and an impressive rocky coastline with pretty white beaches. Elaine dwarfed by idols guarding the world’s largest bronze seated Buddha on Lantau Island. Most visitors, though, travel to Lantau io visit the Po Lin Monastery and its main attraction, the 34 m. high giant outdoor Buddha statue, weighing 250 tons. You have to climb a lot of stairs to reach the platform but it is worth the effort; the scenery is magnificent. The male and female monks of Po Lin provided an excellent vegetarian lunch at a very moderate price. Shopping is definitely one of the best reasons to visit Hong Kong. The contrast between the old world markets and designer boutiques provides variety and excitement to any shopping day. 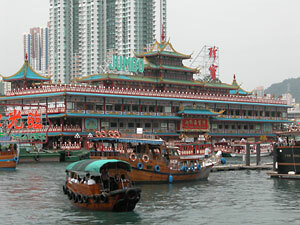 One popular shopping area is on the Hong Kong side of the harbour with its stepped “ladder” streets. Cat Street bazaar is best known for stalls and shops selling antiques, such as watches, old coins and stone carvings. Due to proximity, we preferred the Temple Street Night market in Kowloon. Air pollution is a big concern for anyone staying in the area for more than a few days. Even though weaned on Windsor’s foul air, we found conditions far worse in Hong Kong. In fact, during our stay, the pollution index hit a whopping 201! Thanks to a strong wind, we did enjoy a respite for a couple of days, and the views improved considerably. SARS continues to be top of mind for Hong Kongers. Last year’s outbreak sent the area’s tourism business into a tailspin; with so many people packed into a very small area of land, serious steps have been taken to prevent another epidemic. The tourism business seems to have recovered from the SARS outbreak, according to reports, and many hotels are back to almost full occupancy. Hong Kong’s 7 million people are jammed into a very compact area; the non-stop stream of pedestrians and the sea of taxis, double-decker busses and private cars (usually luxury vehicles), while initially both exciting and disconcerting to the uninitiated visitor, starts to wear a little thin very quickly. Especially since it feels like the locals have a habit of walking straight into you. So on our final day in Hong Kong, we took a relaxing ferry to Lamma Island, less than a 1/2 hour trip from bustling Hong Kong, yet seemingly worlds away. Popular with expats and locals alike, we enjoyed some beach time, a long hike through the hills and then a wonderful meal of chili garlic giant prawns overlooking the harbour. Of course, there were plenty of shops to browse, which offered everything from Chinese artifacts to clothing to kitschy souvenirs. One of the best things about visiting this laid-back island was that there were no cars, trucks or taxis – a welcome relief from the frenetic pace in Hong Kong. As we relaxed at Lamma’s charming seaport reminiscing about similar cafes we’d visited throughout the world, we reflected on our tour of this great city, which is a perfect blend of east meets west, and highly recommended for those who want a taste of Asia without sacrificing the comforts and familiarity of home. Before we left, we decided that a return engagement in Hong Kong was a must. To that end, we purchased a pair of good luck money dragons in the Temple market. And even if they don’t help, they look great on the mantle and are a wonderful reminder of a fantastic journey.